"How to Solve The Biggest Marketing Problem You’ve Struggled With Since You Opened Your Practice." Hi, this is Frank Prieto. I specialize in helping acupuncture practices just like yours get more patients from the internet. Today I wanted to show you how to solve the biggest marketing problem you’ve struggled with since you opened your practice. How do I know this is your biggest marketing problem? Well, because it’s the ONE thing acupuncturists say they’re going to start doing because they know it’s important, but they never get around to it - ever. So what is it that you should be doing that dramatically increases your online exposure helping you take your practice to the next level? The answer, as you probably already know is Blogging. If you did have the time to blog and the will power to do it every month, you’d still have to deal with the SEO and social media aspects of blogging which are just as important as writing the content. Writing a blog post and hitting the ‘Publish’ button doesn’t mean they will come. - There’s more to it than that. You’ve considered outsourcing your blog content, but you’re concerned that the quality of outsourced content might not portray you in a good light. That’s why my team and I developed a done-for-you content marketing service for acupuncturists that solves your blogging problem in a big way. I’d like to introduce you to ACUPowerBlog™. Let me show you what’s inside ACUPowerBlog™, so you can see why I’m so excited about this new service. When you sign up for ACUPowerBlog™, you get a professionally written article every month that is unique to your blog, and written by a published author who is also a practicing acupuncturist. This is a huge deal because for a long time now, acupuncturists have considered outsourcing their blog content, but they’re afraid to put their name on an article a writer wrote because they say that writers are not acupuncturist and the articles won’t be up to their standards. -- With ACUPowerBlog™ that's no longer an issue. Evidence shows that the more content your blog post has, the better chance it has of a top position in Google results (source: SerpIQ.) So every month we furnish you with a well written article of about 1,000 words, because in today's environment, short 200 or 300 word blog post just don't cut it anymore . With ACUPowerBlog™ the content is uniquely written for you and published only on your blog. This is not a membership site where you download short articles to publish on your blog that are already published on other acupuncture websites, resulting in thin-duplicate content that Google ignores. The content is written for your practice with an exclusive unlimited term license (known as ghost writing.) In other words, the author releases the rights to the content so you can use it as your own, as opposed to choosing from a pool of generic, pre-written articles that have already been published on other TCM blogs. Your articles are unique and exclusive to you, so you can benefit from the exposure that only this kind of quality publishing offers. Not only do you get the monthly article ghost written uniquely for you with release rights, you also get to choose the topic you want to publish each month. -- This is also huge because some acupuncturists specialize in certain conditions and want content that reflects their practice. Every article comes with a high quality royalty-free image that gets published with your blog post. This is important because researchers have found that colored visuals increase people's willingness to read a piece of content by 80%. (source: HubSpot). And finally, the piece of the puzzle that brings it all together - The SEO (search engine optimization) and promoting the content on social media. As I said earlier, publishing the content is important, but it’s only one piece of the puzzle. To take your practice to the next level by blogging, you have to optimize that content for the search engines (SEO,) and promote it on social media. ACUPowerBlog™ takes care of this too. You see, before we hit the ‘Publish’ button, every one of your blog post gets optimized with keywords, meta tags, image tags, the right permalink, and a host of other optimization techniques to get you as much exposure as possible. Without SEO you can build it, but they won’t come. After we SEO your blog post and hit the publish button we’re not done yet. We then make our way to the social media networks and share your engaging content on Facebook, Twitter, Google+ and LinkedIn. And if that wasn’t enough, we’ll also set up a Facebook remarketing campaign so the users who visit your blog for the first time, come back again every time you publish a new blog post. - Sweet, right? -- By they way, you also get monthly traffic reports so you can monitor the results of your content marketing strategy to see if it's working or not. By now you’re probably wondering how much will you have to pay for a custom tailored, high-end content marketing program like ACUPowerBlog. A comprehensive content marketing program like ACUPowerBlog is worth between $600 to $700 per month. 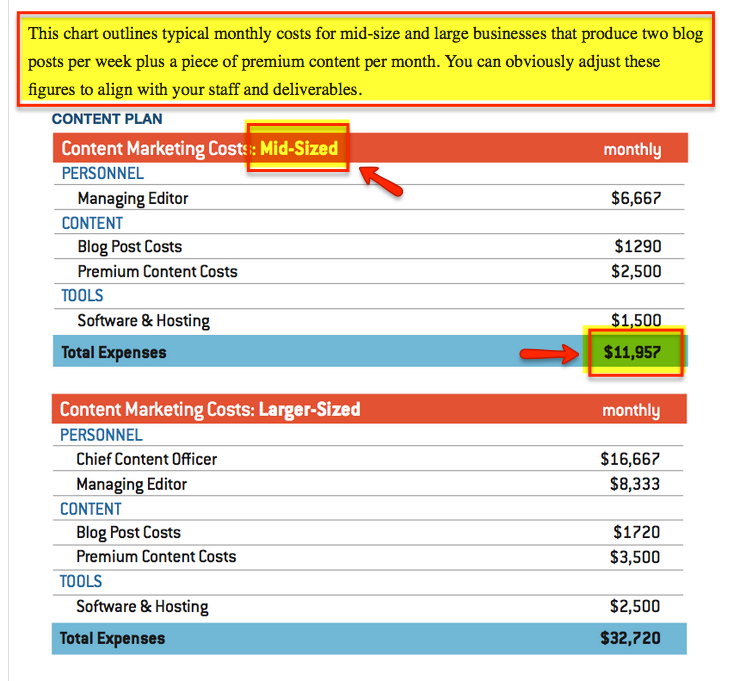 Well, to come up with this figure, I used the data from the Content Marketing Institute website, which published the chart pictured below, showing typical monthly costs for a mid-size business that produces two blog posts per week, plus a piece of premium content per month. Since the numbers on the chart are based on a mid-sized business, and the typical acupuncture practice is a small business, I reduced the price per article by 50%, hence the $664/month figure. But don’t worry - you won’t have to pay $664 per month for ACUPowerBlog. I simply wanted to show you this example, because I think if you tried to do this yourself, your cost would not be too far off from $600 - especially when you take into account what your time is worth. I’ve done my best to show why ACUPowerBlog™ is your best option to help you take your practice to the next level. The truth is there’s nothing like it out there because this requires a lot of work and know-how. I’ve been wanting to offer acupuncturists a professional TCM blogging service like ACUPowerBlog™ for a long time. But I had to wait until we had the right team in place, because this is a joint effort that no one person can pull off by themselves. Today ACUPowerBlog™ is ready for prime time! If you’re not interested in growing your practice using an advanced content marketing strategy like this, then this is clearly not for you. But if you see the enormous opportunity and the competitive advantage your practice will gain from ACUPowerBlog™, then join me today. You won’t have to pay $664, or $564 or even $464. If you sign up for ACUPowerBlog™ today, you can lock-it-in at only $399/month. Click the sign up button below to get started today. There are no contracts and you can cancel anytime. We only require a 30 day notice. No refunds. Due to the amount of work involved in a service like this, it's obvious we can only take a limited number of clients. So we reserve the right to end this offer at any time without notice. If you want this, don't wait too long because the price may go up at anytime.